You can consider performing a Clean Boot on your Windows 10 Laptop or computer, if it is bothering you with hard to fix error messages. 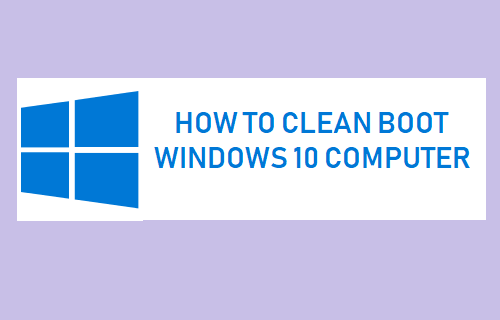 You will find below steps to Clean Boot Windows 10 computer. Clean Boot can be defined as one of the diagnostic tools available in Windows 10, which makes it easy to troubleshoot problems on a computer. 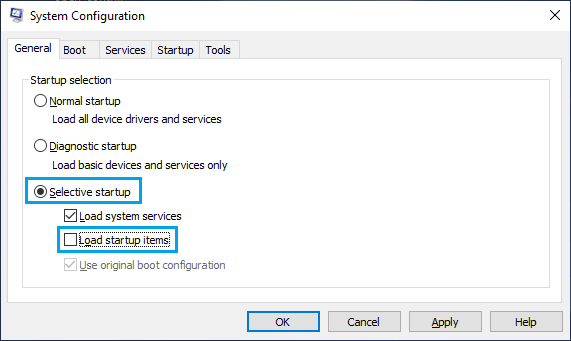 When you Clean Boot Windows 10 computer, you can choose to start your device using only the required system services and/or with/without startup items. 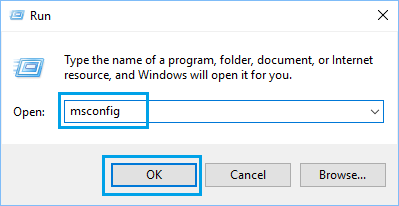 This allows you to selectively enable/disable the remaining programs and services on your computer and identify the incompatible program or service, causing problems on your device. Once you have identified the cause, you can manually remove or disable the program/service and come out of the Clean Boot Mode by giving your computer a Normal start. Note: Your computer may lose some functionality when you Clean Boot Windows 10. However, all the functions will be restored, when you start Windows 10 normally. Follow the steps below to Clean Boot Windows 10 computer. 2. 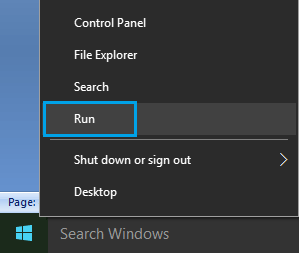 In the Run command window, type msconfig and click on OK.
3. 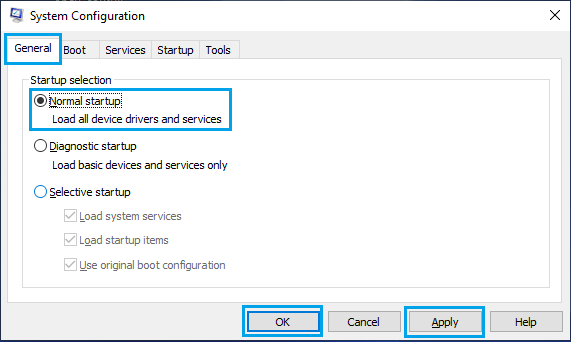 On the System Configuration screen, click on the Services tab, select Hide All Microsoft Services check box and click on Disable All button. Note: Hiding Microsoft Services ensures that you do not accidentally disable any essential Microsoft service. 4. Next, click on the Startup tab and click on Open Task Manager link. Note: Do not close the System Configuration screen, as you will be coming back to it later. 5. 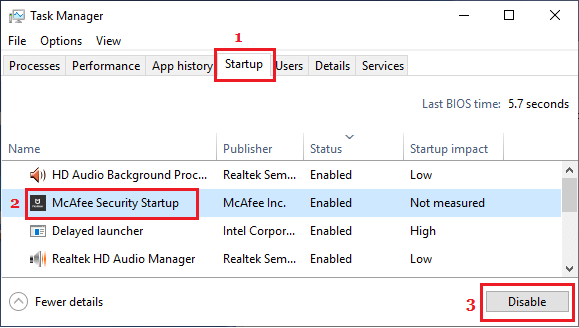 On the Task Manager screen, click on the Startup tab > select the program that you believe might be causing problems on your computer and click on Disable. 6. After disabling suspected programs, go back to System Configuration screen > click on the General tab > choose Selective startup option > clear Load Startup Items check box. Note: Make sure Load System Services and Use Original boot configuration options are checked. 7. Click on Apply/OK to start your computer in Clean Boot Mode. Depending on your case, you may have to repeat the above steps multiple times, in order to identify the program or service responsible for the problem on your computer. After you are done with troubleshooting, you will have to disable Clean Boot Mode on your computer by following the steps below. 1. Open Run command > type msconfig and click on OK.
2. On System Configuration screen, click on the Services tab > uncheck Hide All Microsoft Services box and click on Enable All button. 3. Next, click on the General tab, select Normal startup option. 4. Click on Apply/OK to start your computer normally. Once your computer starts using Normal Startup, all the services and programs that were temporarily disabled during Clean Boot Mode will be restored on your computer.